Giovanni Bastianini (see previous column) was born September 17, 1830 to an impoverished family in the old Tuscan village of Fiesole three miles northeast of Florence. He was born with an incredible eye and gifted hands but with little opportunity for developing his genius. When the boy was seventeen his gift was discovered by an opportunistic picture dealer, the Florentine Antonio Freppa. The boy needed training and discipline; in the right circumstances there is no telling how great he might have become. But Freppa was a Fagan. Freppa would sell anything that came his way, with no questions asked. He did not, at first, specialize in antiquarian works, but as he became more aware of the boy's abilities he instructed him to model in the antique manner. The first ten years of the relationship are obscure, and it was not until Giovanni was about twenty-seven that he began to achieve brilliance. Bastianini was as much a prisoner of Italy and its lost grandeurs as he was of Freppa. He was surrounded by them on every side. If there were any modern currents in Florence they were weak and hidden. Florence was neither Paris nor Dusseldorf. What a pity, for the boy. Freppa started him out doing fireplaces and bas-reliefs--souvenir brick-a-brac. Finally he allowed the sculptor to create a series of busts of celebrated women. As the work became more perfect imitations of Renaissance sculpture, Freppa began selling it as antique. Freppa was very cagey. He played the ignorant fool, a dupe who was unable to recognize authorship, a dolt who priced masterpieces so low that he deserved to lose them for pittances. The first important sale was a piece representing The Holy Family. Freppa never claimed it was by Andrea del Verrocchio (1435-1488). He let a raider make that secret conclusion, as time and again dealers would make discoveries, pay Freppa modest prices, and resell at fabulous profits. Freppa could not have been ignorant of what was happening, and from time to time, especially in the later years, he must have burned to think of the high rewards others were taking. Even before the de Nolivos sale, Bastianini's pieces were finding their way into important collections. Not knowing it was buying fakes, in 1857 the Victoria and Albert Museum in London paid 80 pounds for a marble relief of the Madonna and Child and Cherubs' Heads attributed to Antonio Rosellino (1427-1479); 60 pounds in 1861 for a terracotta bust attributed to an unknown Renaissance sculptor; and 60 pounds in 1863 for a similar piece. To make his terracotta bust of Savonarola Bastianini needed a model. What did the mad monk look like? He used a Florentine medallion as inspiration. This gave him special problems. Medals are sculptures in miniature, and practically speaking they are little better than two-dimensional representations. Medals are void of details and perspectives. What did the subject look like from another angle? The medal cannot say. How did the person's character show itself in his face? The medal can hardly even hint. Techniques for creating counterfeit duplicates of metal castings or stone carvings are straight forward and simple, even though ofttimes laborious. But creating a fake in one medium using another as the inspiration is a daunting task. Bastianini had to create his own Savonarola--and he had to do it in a way that would look to the people of his day in exactly the way that people of his day thought Renaissance art should look. That's a peculiar statement to make! But it is endemic to all cases of forgery. Every generation has its own way of looking at things, whether it's art, behavior, philosophy, or history. Every generation has its perspectives, its own fields of awareness, its own values. Every generation looks at the same thing and sees it differently. That's why initially forgeries are often thought to be better art than something original from the period or person being imitated. And that's why the forger's worst enemy is time--as perspectives change experts are able to look back at something that has been fooling people for years and discover the clues to falsity. The objects have not changed, but the ability to see has. Savonarola was executed in teracotta, a clay which usually contains a reddish iron oxide. It was perfect for this bust because, being easy to work and correctable, Bastianini could experiment more freely as he sought to create three-dimensional reality from a two dimensional model. In the weeks following Bastianini's death, after Freppa had blown the whistle on the fake bust of Benivieni, the truth slowly came out. A lot of people ate crow. Banti and Costa, who had paid 10,000 lire to another dealer for Savonarola and had exhibited it in the Palazzo Riccardi in Florence, now found that they could not sell it at any price. So they gave it to the museum which had been made out of the Monastery of San Marco in Florence, where Savonarola had been prior. Bastianini's bust was honorably ensconced in the cell formerly occupied by the monk. 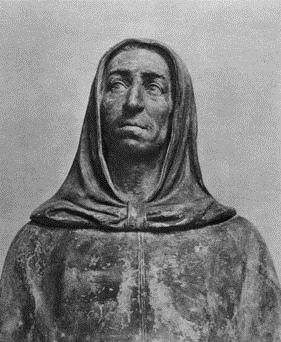 Savonarola, a terracotta portrait bust attributed to various Renaissance artists but actually a 19th-century Giavanni Bastianini fake.